Cold Porcelain DVDs are the fastest and most effective way to learn the Sangeeta method and get all the detailed information you need to create your art. Sangeeta Shah, our resident cold porcelain & gum paste expert, artist, teacher has developed the DVD series especially for you. She was once exactly like you, just an ordinary person, with a creative urge and no formal training. She had a lot of patience when it came to researching her chosen art form - which you can read about here on this site. You can also ask Sangeeta direct questions on this site. However good a facility this is ..... (and it is one of the blessings of modern technology!) it is only part of the story. Sometimes you have to see with your own eyes to get the insights and information you need. Her DVDs have been especially designed for people using her cold porcelain recipe - available free on this site..... and she also applies her special Gum Paste recipe. You will make wonderful works of art - and everyone will love you for it. You will become an expert in your own community and even go onto share your knowledge with others - just like Sangeeta and me. 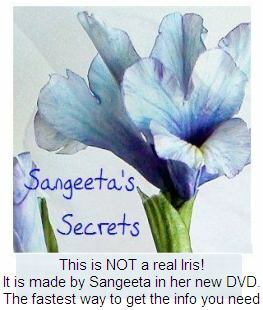 You now have everything you need because Sangeeta's DVDs are now available. There are three DVDs available below, please simply look at which flower represents the closest to your artistic aims and click on the 'ORDER' button. This will take you through to Sangeeta's order page. 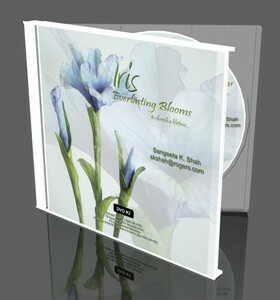 Learn how to make the Dutch Iris flower through its flowering stages in gum paste or cold porcelain. The DVD will be shipped within 3 working days of cleared payment. 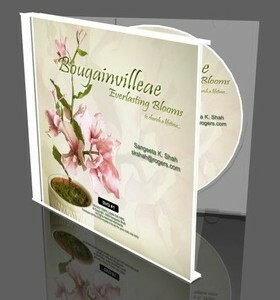 Learn how to make the Bougainvillea Plant flower through its flowering stages in gum paste or cold porcelain. 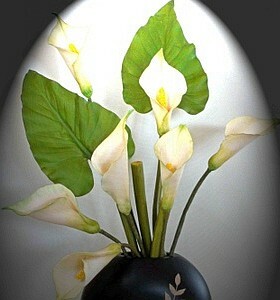 Learn how to make the Calla Lilies Plant flower through its flowering stages in gum paste or cold porcelain.